“Wednesday Crucifixion and Three Baptisms” from Christian Faith Publishing author Victor Bittner is the culmination of years of research into the Triune God. Author Victor Bittner presents a study into the Triune God and the events surrounding the death, burial, and resurrection of Jesus Christ. “Wednesday Crucifixion and Three Baptisms”: a study of the Triune God. “Wednesday Crucifixion and Three Baptisms” is the creation of published author, Victor Bittner. Victor Behring Bittner grew up in the Lutheran Church-Missouri Synod as one of Lutheran minister Rev. Louis O. Bittner and Irma Behring Bittner’s four sons. He holds an AA degree from Concordia of St. Paul, Minnesota and a BD from Concordia Seminary of Springfield, Illinois. Published by Christian Faith Publishing, Victor Bittner’s new book explores the Triune God. Victor Behring Bittner grew up in the Lutheran Church. He was ordained then installed as a Lutheran pastor. He served three congregations of the Lutheran Church from 1959 to 1973. While attending an Assembly of God Church, he became involved in the charismatic ministry from 1973 to 1980. During that same period, he also began research into the subject of this book. Through the guidance of the Holy Spirit, author Victor Bittner focused his attention on the Triune God and His role in the prophecies and events surrounding the death, burial, and resurrection of Jesus Christ. His research also explored the Holy Spirit’s role in the church as well as the role of the Father, Son, and Holy Spirit in the baptism. “Wednesday Crucifixion and Three Baptisms” is the culmination of that research. View a synopsis of “Wednesday Crucifixion and Three Baptisms” on YouTube. Consumers can purchase “Wednesday Crucifixion and Three Baptisms” at traditional brick & mortar bookstores, or online at Amazon.com, Apple iTunes store, Kobo or Barnes and Noble. 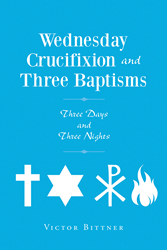 For additional information or inquiries about “Wednesday Crucifixion and Three Baptisms”, contact the Christian Faith Publishing media department at 866-554-0919.